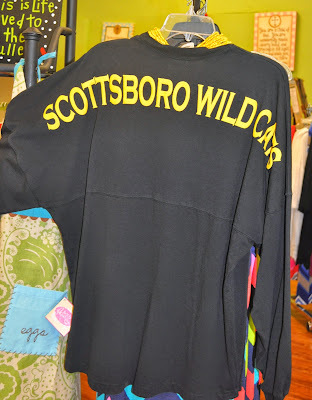 If you happen to be in town on a hunt for treasure at Unclaimed Baggage, one of the best places to grab lunch in Scottsboro, Alabama is McCutchen's Magnolia House. Called simply Magnolia by locals, the restaurant is located in a stately blue Victorian just off the historic downtown square and a few blocks down the road from Unclaimed Baggage. The old home, which is still owned by descendants of the original owners, was a gift shop for years before being turned into a restaurant. One day last summer, my friends Deborah and Dede and I enjoyed lunch at the Magnolia and afterwards took a little stroll around the town square. One of our favorite things about the Magnolia are the warm rolls served with delicious strawberry butter. 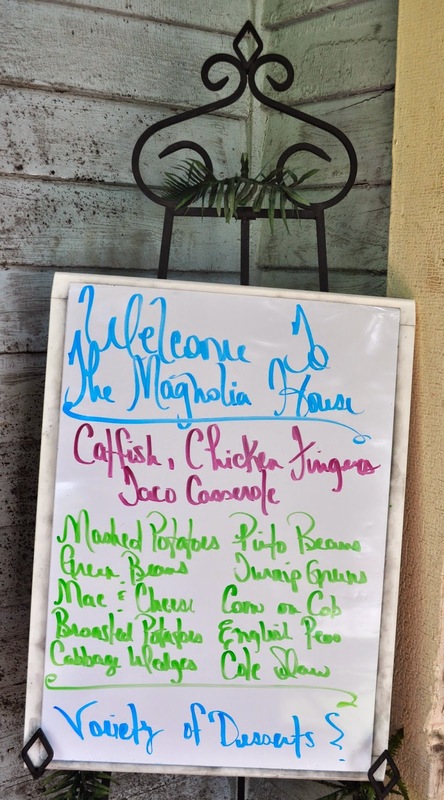 The Magnolia offers a hot lunch buffet, which is not self serve. It is an old timey buffet like the ones at Morrison's or Picadilly, where you select items from the buffet and a server fills your plate. I have to say, as a teacher who has watched too many little children filling their plates in a self serve line, keeping the food safely behind a plexiglass barrier is a welcome idea. On the day we were there, the meat choices were chicken fingers, fried catfish and taco casserole. Sides included mashed potatoes, pinto beans, green beans, turnip greens, macaroni and cheese, corn on the cob, broasted potatoes, English peas, cabbage wedges, coleslaw, sliced tomatoes, onion slices, corn bread, Mexican cornbread, and dinner rolls. At the Magnolia, you can also order from menu items not on the buffet, which is what we opted to do this day. 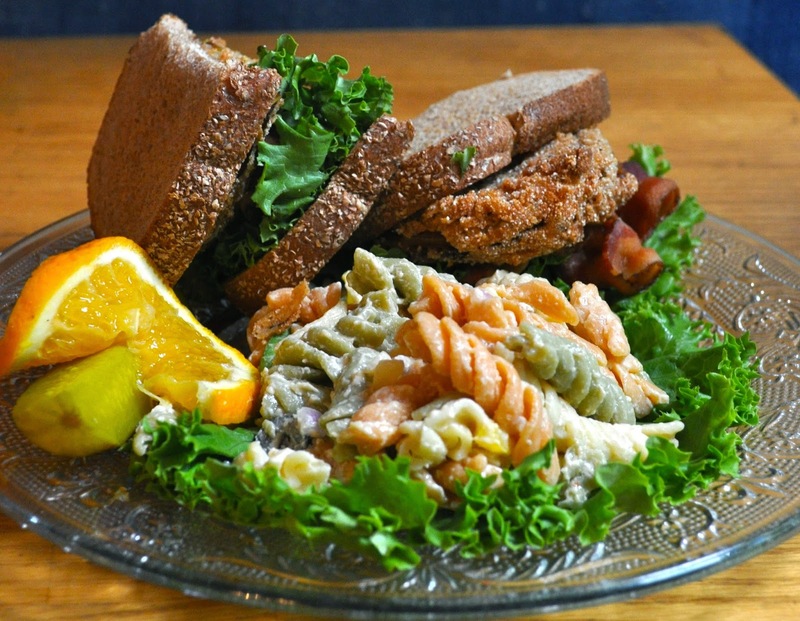 Deborah chose a fried green tomato BLT with a side of pasta salad. I have had that sandwich before and it is delicious! 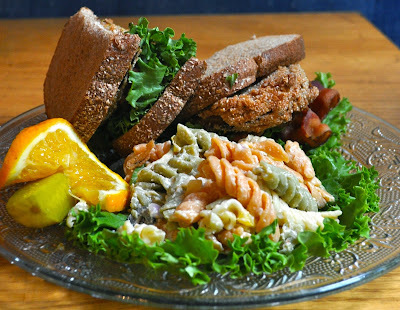 Dede's choice was a salad plate which included strawberry pretzel salad, chicken salad, fresh fruit and pasta salad. Isn't it pretty? I couldn't resist Magnolia's chicken salad sandwich with a cup of fresh fruit. Look how much chicken salad they put on that sandwich! Lunch was delicious and so was the company. We enjoyed ourselves so much and the day was so beautiful, we decided to take a walk around the square and do a little shopping. I love this picture of my friends! and the deals on favorite team shirts. Footworks had lots of cute shoes, handbags and North Face jackets, too! If antiques and collectibles are your thing, be sure to visit La De Da's. Dede found a real mink stole...head and all! I loved this pretty teacup! Remember these Corning Ware casserole dishes with the blue cornflower? How about a colorful rooster pitcher? It was a fun day of lunch and shopping! Three Friends and a Fork, Deborah and Dede give McCutchen's Magnolia House 3 fun Yums UP!